“It Takes a Big Day (Dog!) to Weigh a Ton.” Climbing The House/Anderson on Mt Alberta NF. | Great Escape. Nick Bullock. ← Bears and The Raven and The North Face of Alberta. “It Takes a Big Day (Dog!) to Weigh a Ton.” Climbing The House/Anderson on Mt Alberta NF. 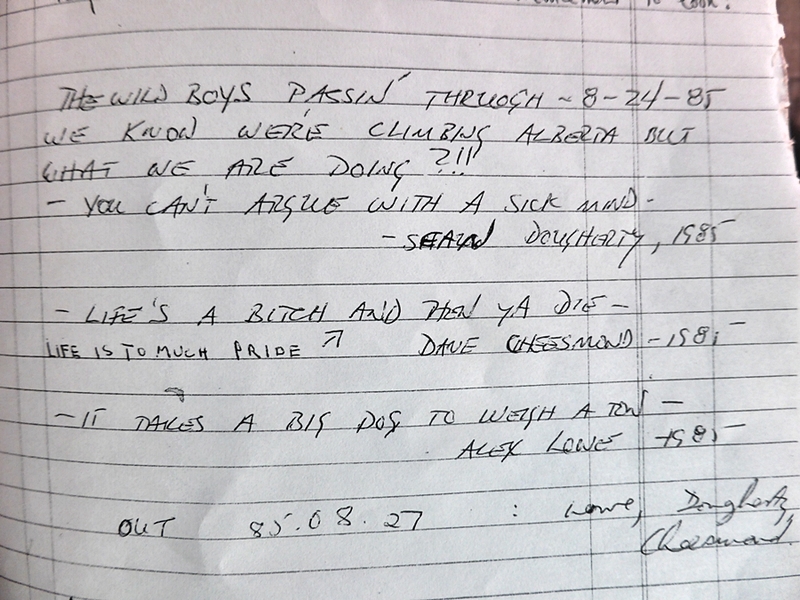 Just one of the historic and entertaining entries in the Alberta Hut book. 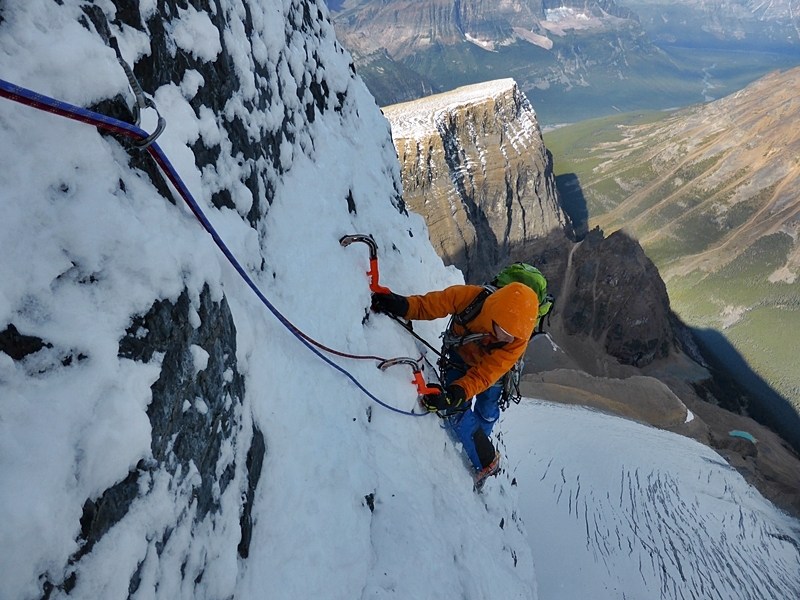 Since 2000 when I first travelled to a winter bound Canada with Bruce French, I have returned six times and with each visit my interest and knowledge of Alpine climbing in the Rockies has grown. For some reason, no not for some reason, but because of the stories, the characters, the wildness and the size of the rubbly faces, Canadian Alpine climbing has always struck me as being ‘more out there’ than alpine climbing in many other countries, lets face it, for starters it has bears that may eat you. Canada is first world and because of this it is difficult to appreciate that it can be more intimidating and committing than in the Himalayas, but when Will Sim and I dropped onto the glacier after five abseils with only one belay plate between us, one night of food and a few bars, no sleeping bags or mats and absolutely no way to contact anyone and the car a climb, a walk, a col and another four-hours walk away and parked in the middle of nowhere – the one-thousand metre north face of Alberta looked and felt like what I imagine the moon might, but actually the moon, has had more people set foot upon it. 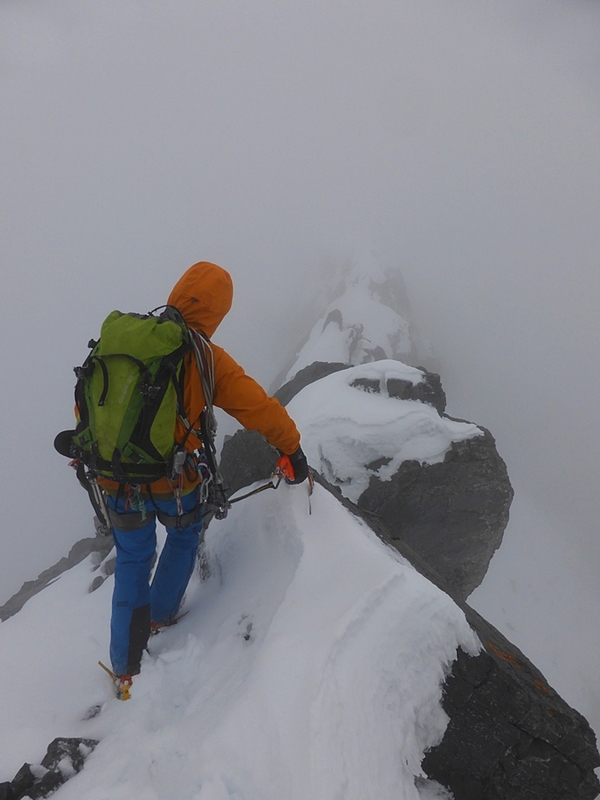 To quote well known Canadian Alpine activist, Jon Walsh, “The north face of Alberta has only been climbed about five times since the 90’s.” And as big as it is, it only has four established lines, two of which have not been repeated. Hyperbole? I don’t think so, but climbing the second ascent of The House/Anderson on the North Face of Alberta [Jason Kruk and Joshua Lavigne climbed the first half of the route until going direct from the cave on day two] for me was as committing, possibly more so, than climbing The Slovak Direct on Denali where at least the rangers knew where we were and they had a chopper at hand or, also with Andy Houseman, on Chang Himal North Face in Nepal where we had Bhuddie our cook keeping an eye with a finger on the sat phone. 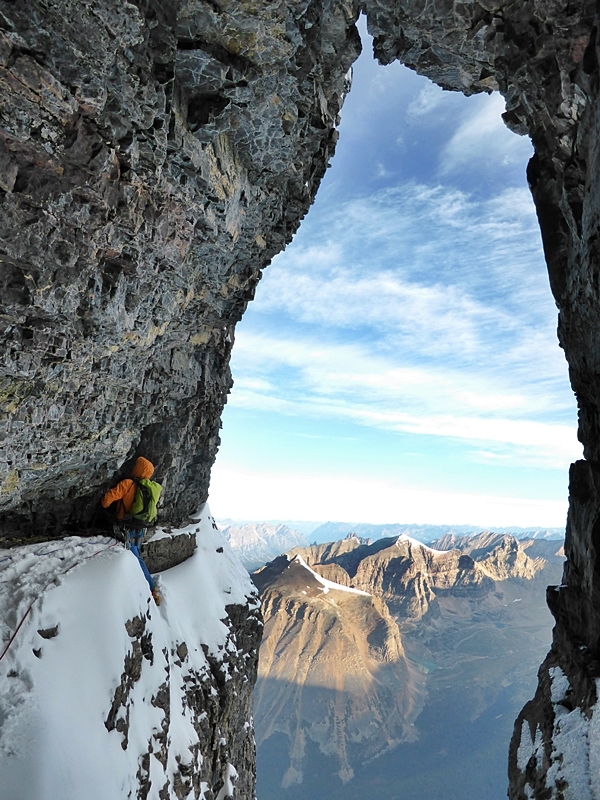 But on saying this, people in the know and who have been involved in Canadian Alpine climbing have been sticking there necks out for years and this in my mind is outrageous and inspirational. 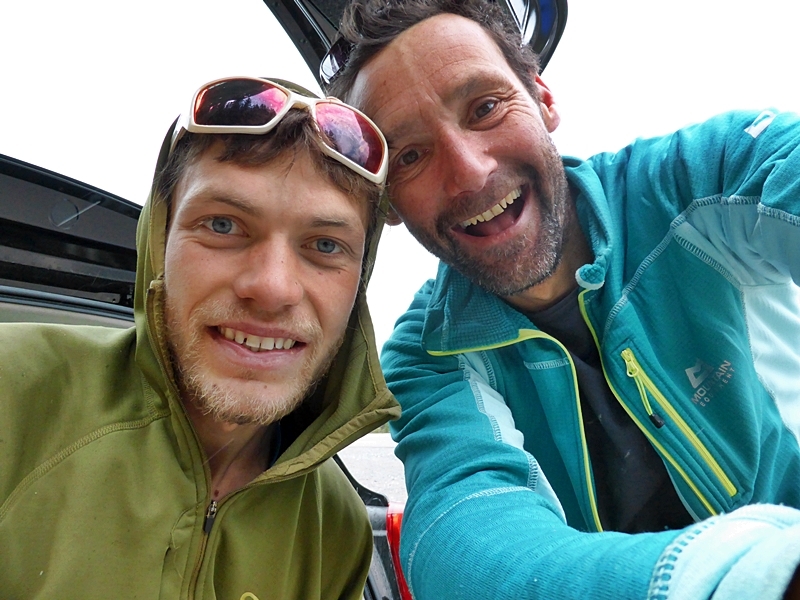 At least Will Sim and I had a reliable weather forecast, modern clothing, modern climbing gear and the experience of others who had gone before. 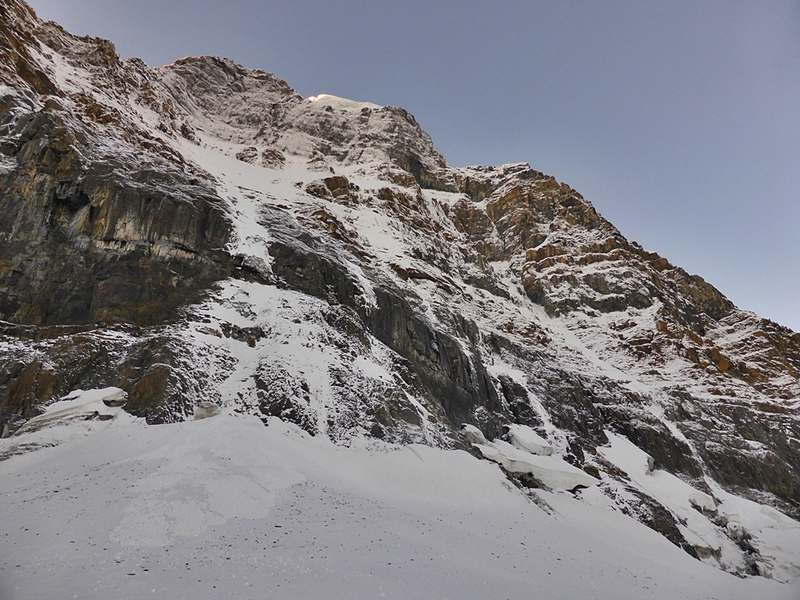 Throughout the climb, which took two and a half days from leaving the garden shed that is the Alberta Hut to returning, both Will and I could not believe Steve House and Vince Anderson’s audacity climbing the first ascent of this route a few days out of ‘official’ winter. And reading the old comments in the hut book with well know names or not so well know if you are from Europe, such as Dave Cheesmond, Alex Lowe, Sean Docherty, Barry Blanchard, Jim Ezlinga, Steve Swenson, Joe Josephson and some of the more recent comments from Jon Walsh, Ian Welsted, Chris Brazeau, Raphael Slawinski and Mark Westerman, it is almost as intimidating as looking down into The Black Hole beneath North Twin knowing you are about to commit. Time has moved on and personally I feel that some of the alpine climbing we used to think was ‘out there’ in our European back yard and even some of the Greater Ranges areas has been reduced to holiday destination because of all that the modern world has given in way of reports, information, rescue possibilities and communication. 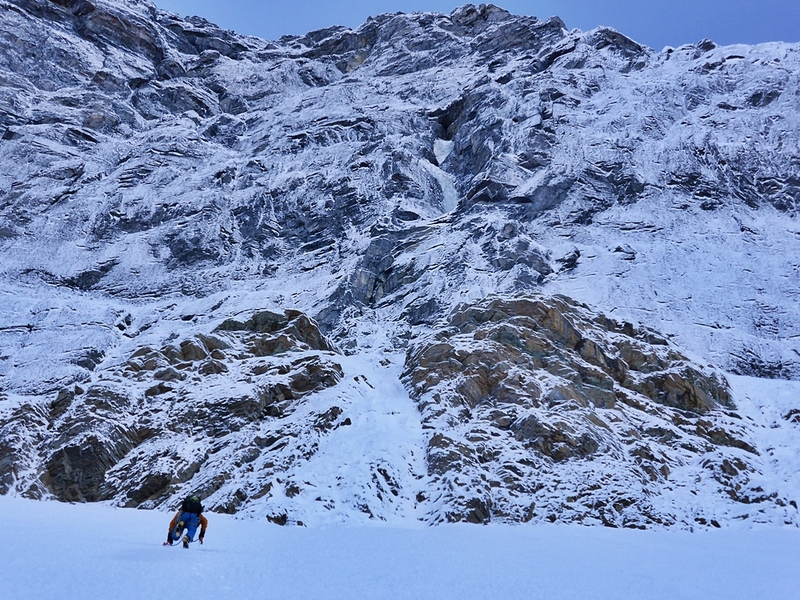 I’m glad to say that alpinism in Canada appears to be way behind and the mountains give challenges that the more solid and closer to the lifts can not and because of this I take my hat off to you gents and ladies who practice going to the hills in Canada. 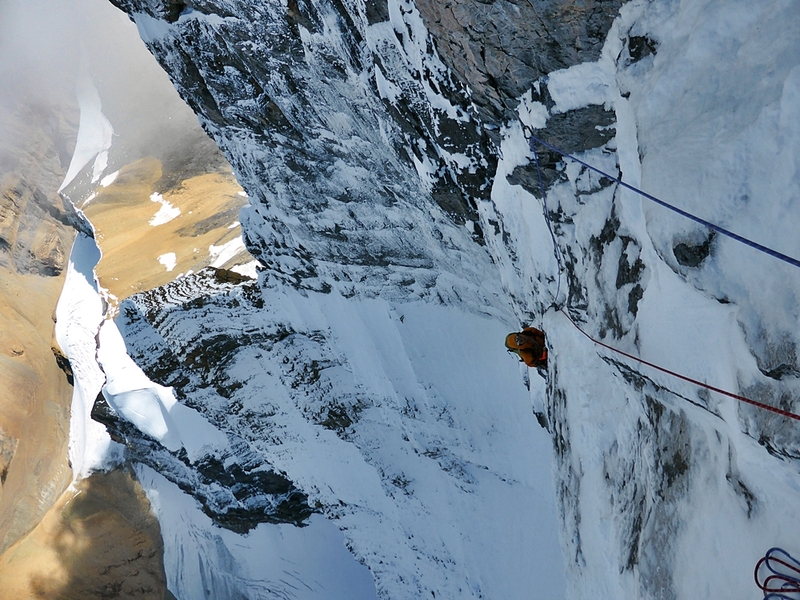 Here is a link to Steve House’s photo blog of climbing the first ascent. 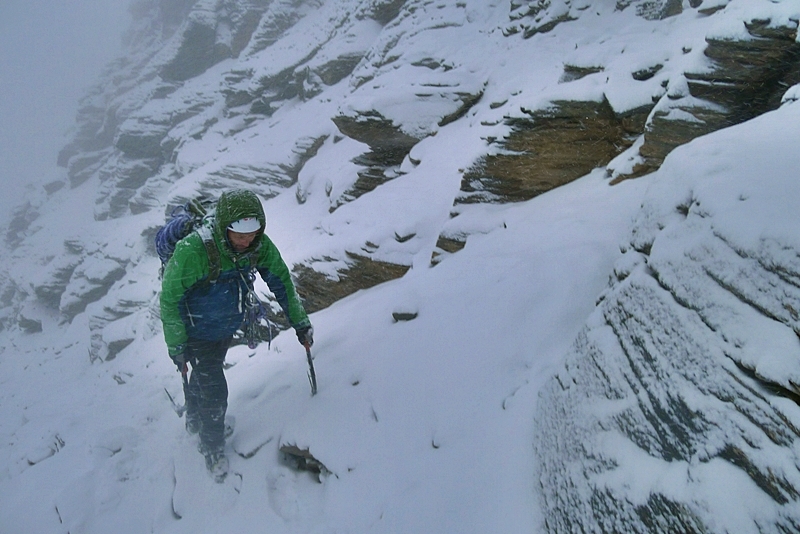 Here is a link to Joshua Lavigne’s short of Jason Kruk and himself climbing on Alberta. Big thanks to Jo and Colin Croston for the loan of loads of camping gear, friendship, Canadian Salmon and the doss in Jo’s Dad’s condo! And once again to the ACC for the hospitality at their clubhouse in Canmore and to the locals who have given info and inspiration. 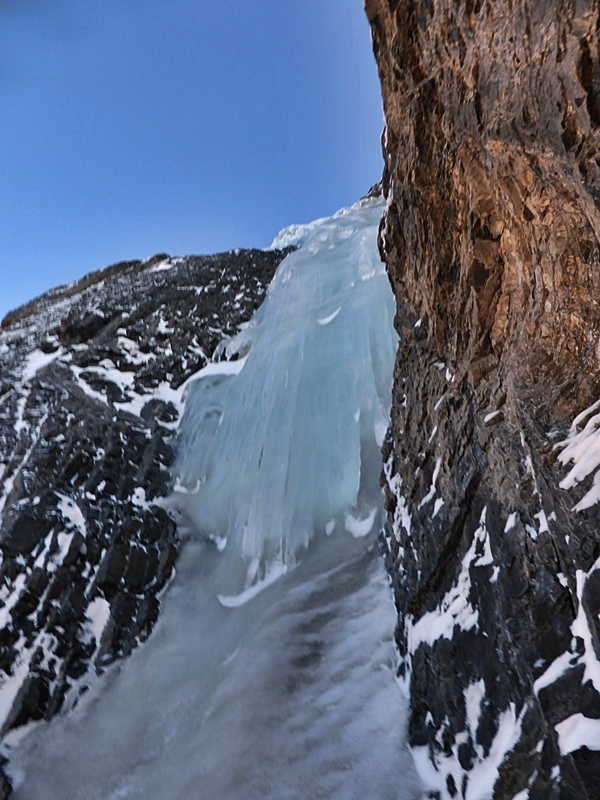 Will making the last of the five abseils onto the glacier beneath Mt Alberta. Yes, I know we were in the wrong place! “Wow, have you seen how wintery it looks?” Says Will. I had but I was just trying to ignore it. Will Sim getting us going. 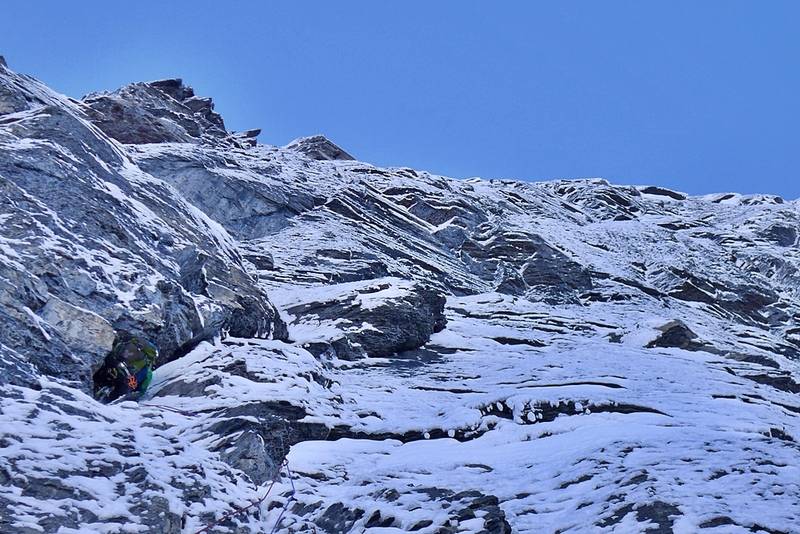 Will Sim approaching the headwall. 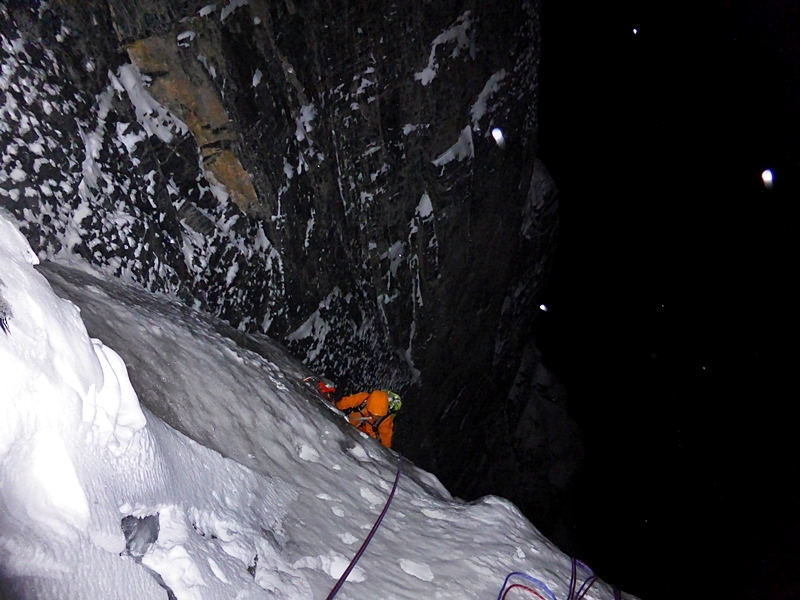 Myself climbing the first M7 pitch of the headwall. 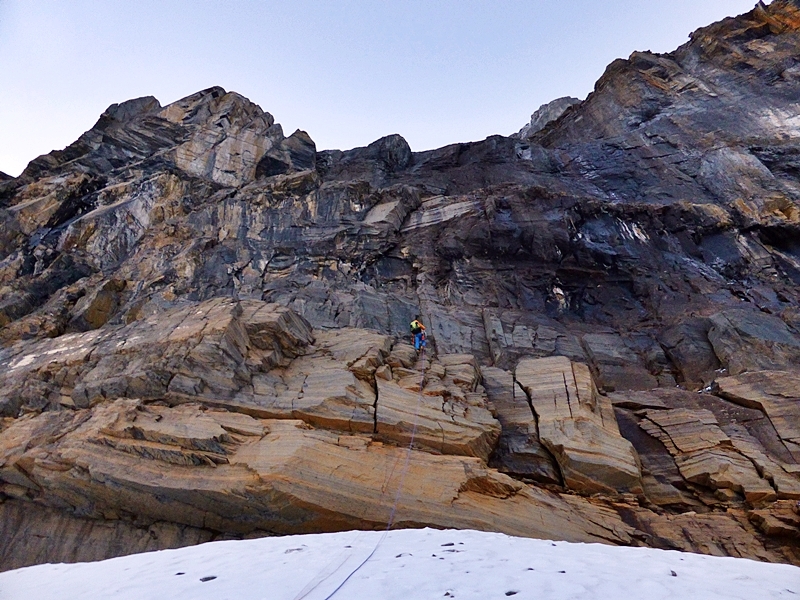 Will Sim on the second M7 pitch of the headwall. Having battled through a very hard roof where, no mention was made of on the first ascent so I can only imagine it was ice, we were faced with this, hard steep glacial ice and an even harder pitch of really scary collapsible ice above where I tunnelled and cut a window from inside to escape. 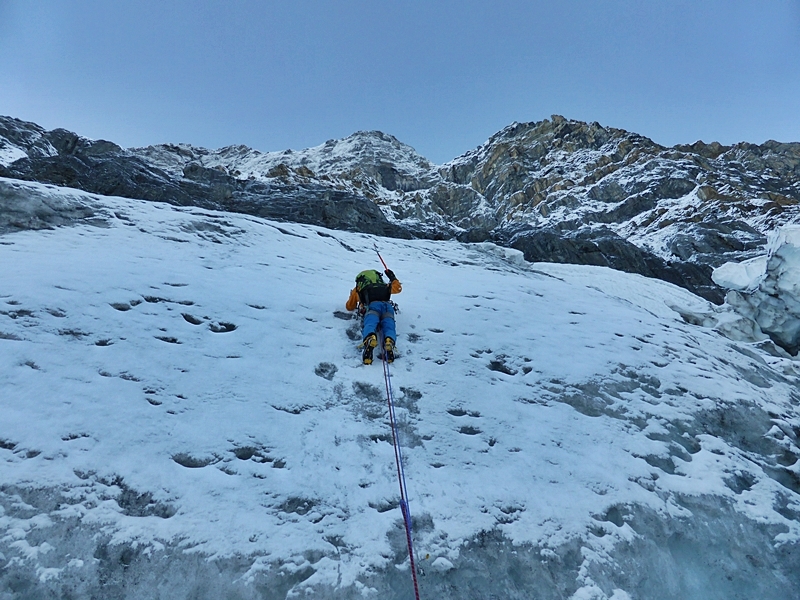 Will belayed beneath with his rucksack over his head but I don’t think that would have helped should a thousand tons of ice hit him. 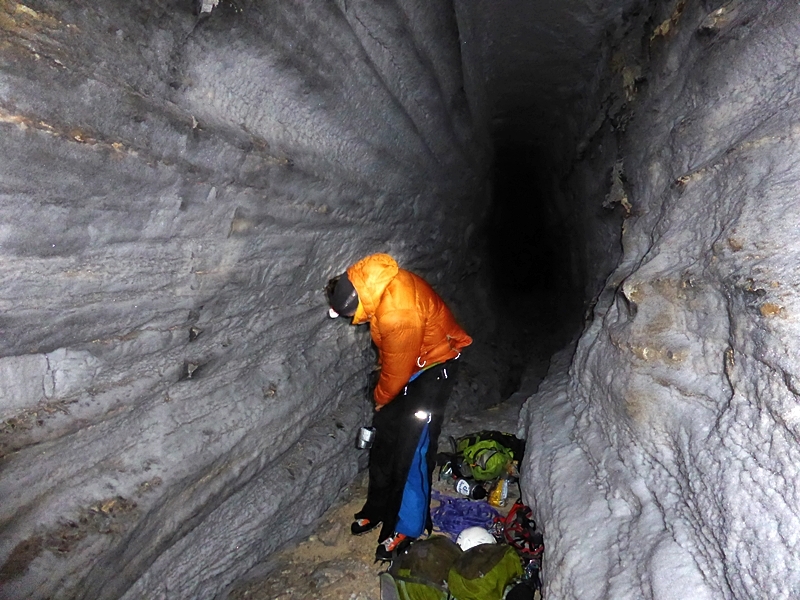 There was one overhanging mixed chimney pitch after this to reach the cave. 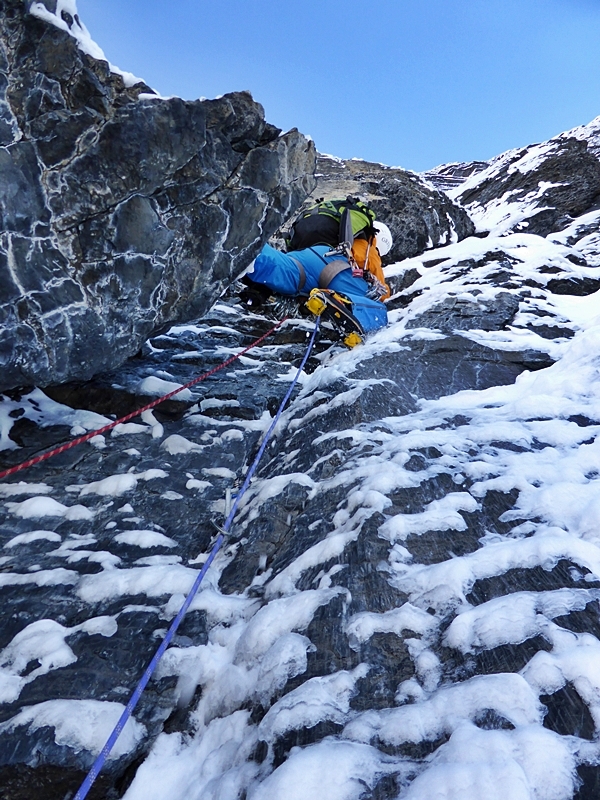 Will seconding the really scary ice pitch having escaped from the cave through the window. The cave bivvy. Yes please. Day two leaving the cave. Not believing where the next pitch goes I belay and leave it to the 24 year old. Well, you don’t get to my age without cunning! Reaching the summit ridge Will begins the masterful art of getting me back to the ground. After getting a little lost in the dark and whiteout on the descent we bivvied under separate rocks in the snow and waited it out till daylight. We then retraced steps and found the correct way. Back at the car Wednesday afternoon after leaving it on Saturday morning. 9 Responses to “It Takes a Big Day (Dog!) to Weigh a Ton.” Climbing The House/Anderson on Mt Alberta NF. That’s wicked awesome dudes! Congrats! Fantastic!! So stoked for you guys – true adventure in every sense of the word. looks an amazing climb, but doesn’t that say Dog? Hi Phil, yeah, both Will and I thought it said dog and what a great saying but after thinking about it I’m pretty sure its day, wonder if we will ever know? I’m pretty sure it’s dog, not day but I guess it doesn’t really matter. What matters is this was an awesome adventure. Thanks for sharing it with those of us who can only dream of such things. Yeah, I wrote it up originally as dog, then in a red wine fug last night changed it to day as it all became apparent under the influence of good Malbec. I think day makes more sense but dog is definitely more quirky and fun…Someone out there must know? “It takes a big dog to weigh a ton = amount of crap you will have in your pants after arguing with the dog” As they say out here… AWESOME! And well done on the detective work Ken. Can’t imagine the level of commitment or what you felt getting back into the valley. Love the blog – Well done guys. Safe trip.